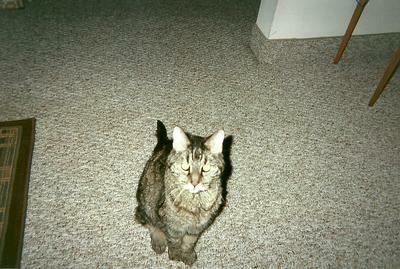 Maxie was 17 years old, I had to put her to sleep because she was heading for kidney failure. She had a very weak heart and she only weighed 6 or 7 pounds. I had Maxie since she was a kitten. She loved the outdoors. I had to put her on a leash because she was declawed, but she didn't mind the leash at all. She would run and play and eat the grass. I live in a apartment complex, and when she saw someone walking on the sidewalk, she would run up to them to say "hi." Also, she loved to look out windows. She would spend most of the day looking outside. Maxie loved to cuddle too. I would be lying on the sofa or bed and she would jump up by my side and purr. Rest In Peace, Maxie, you will surely be missed. Maxie was a beautiful kitty. Your heart grieves and just know you are not alone. My prayers are with you. I'm sorry to hear about Maxie, Kelly. She sounds like a very special kitty. RIP little one.